Welcome @chame, nice to have you here. If you have questions, I’m sure the whole community will be happy to help. would it be possible to resize the image array with the mouse? Maybe have a ‘grip’ on the right and bottom so we could just drag those edges in or out to add more pixels? 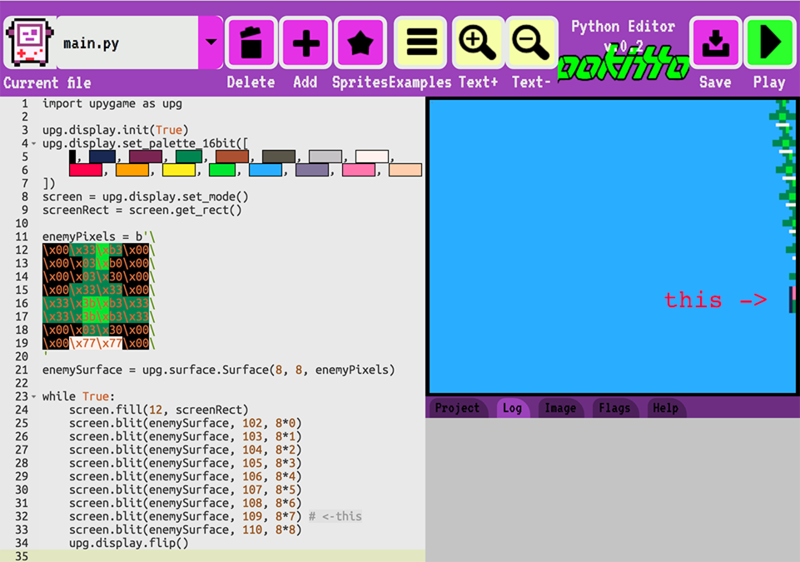 I don’t have real Pokitto yet, but MicroPython looks interesting. It seems the editor needs cookies to function. Also, does micropython for the Pokitto support type hints? Not exactly cookies, but it needs local storage. That’s what it uses to backup your code, since there is no cloud storage. I’ll make backups optional. Is there no math module? It seems I can’t use sqrt in that case, so I can’t get the magnitude of a vector. Or sin or cos for that matter, so I can’t create a vector facing a specific angle. I’m having trouble with using decimal numbers. If I try to do e.g. print(0.15) then the game won’t compile (the play button doesn’t even grey out) and I don’t get any error message. Floats are not supported, so I guess that explains why you cannot use any of the functions you mention. It would require fixed points as well as lookup tables. Been there, done that, wrote the library - it’s not very fun. This all I know ofcourse.